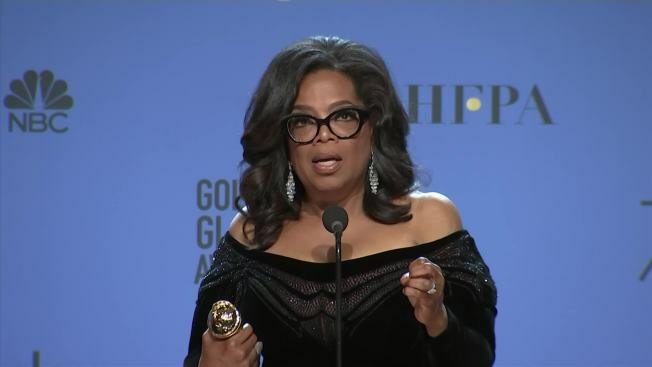 Oprah Winfrey's acceptance speech for a lifetime achievement award at the 75th Annual Golden Globes on Sunday resulted in a rallying cry for her to run for president. But NBC sparked a backlash after a message posted on the network's Twitter account referred to Winfrey as "OUR president." The network deleted the tweet Monday morning, saying the message was posted by a "third party," had been in reference to a joke from host Seth Meyers' monologue and was "not meant to be a political statement." Winfrey's Cecil B. DeMille Award acceptance speech was a full-throated tribute to the women and men who support the #MeToo Movement. "It will be because of a lot of magnificent women... and some pretty phenomenal men, fighting hard to make sure that they become the leaders who take us to the time when no body ever has to say 'me too' again," Winfrey said. She expressed homage to Recy Taylor, a black woman from Alabama who was kidnapped and raped by six white men in the 1940s. Taylor never saw justice and died just 10 days ago. Rosa Parks served as her appointed caseworker. Winfrey said in honor of all women and men who've experienced abuse that "speaking your truth is the most powerful tool you all have." Reese Witherspoon, Winfrey's co-star in "A Wrinkle In Time," introduced Winfrey and said her hugs could end all wars. Calls for Winfrey to run for president echoed on social media. And Winfrey's partner, Stedman Graham, told The Los Angeles Times that a potential presidential run would be "up to the people." "She would absolutely do it," he was quoted as saying. Well before Winfrey's speech, NBC had tweeted this during Sunday's broadcast: "Nothing but respect for OUR future president. #GoldenGlobes"
The tweet on the network's account came in the wake of jokes by Meyers about the possibility of Winfrey running for office. Pointing at actor Tom Hanks, Meyers said, "you will never be vice president. You are too mean and unrelatable." NBC's tweet drew criticism from some prominent conservatives, including Donald Trump Jr., who called it another example of media bias against his father, President Donald Trump. In deleting the tweet on Monday, NBC said in a pair of messages that it was "not meant to be a political statement."